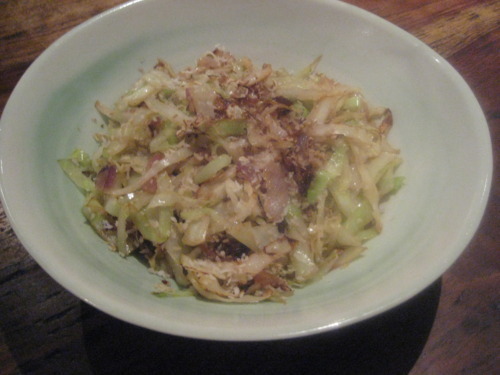 Stir fried cabbage! | Izzy have you eaten? When we have a rice-and-curry meal together, this side dish always seems to be the favourite vegetable option. Sometimes I substitute green beans for the cabbage, and that is a nice alternative, so keep it in mind. It is quick to make, so a tip is to have everything sliced and ready to go. Toss it in a hot wok/saucepan just before you are ready to serve the meal. It is cooked in ten minutes flat! To give it a more Indian-y flavour, add a teaspoonful of cumin seeds, and a half teaspoonful of tumeric with the onion and ginger at the start of the cooking process. This recipe serves four people. if your cabbage is still mostly uncooked, add a quarter cup of water, and cover with a lid for a minute. 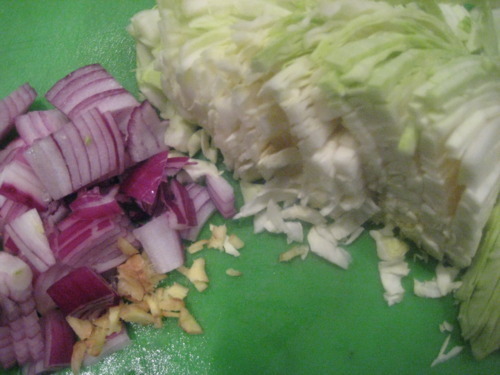 This entry was posted in GROUP C, Uncategorized and tagged Cabbage, Cummin, Onion, Vegetarian by tgb9593. Bookmark the permalink.